Crysis is first and foremost the most amazing looking game so far. When it first came out about a year ago on TV, it was like looking at a movie. I thought it was a cutscene except it is the whole game that looks this good. Just look at the screenshots. Lush jungles are actually alive with everything moving in much the same way as a real one. Snow falls and when hit by bullets they explode in puffs. When you interact with your squadmates, their facial animation that brings them to life. They can convey emotion with subtle facial gestures. Question is, is the game worthy of the graphics? Crysis is an alien invasion game set in 2020. An archeological team on a remote Pacific island is captured by an invasion force of North Koreans. You belong to a US Special Forces team dispatched to rescue. Since it is 2020, you dress up in a very clever high-tech nanosuits capable of boosting your strength, speed, and armor, as well as cloaking you temporarily to the enemy. You drop into the jungle to find enemies both human and something much more sinister that is busy ripping up everyone. Sounds a bit like the movie Predator eh? 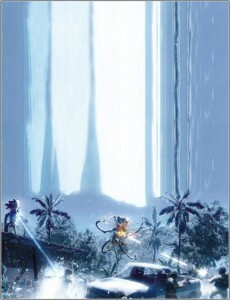 Crysis is a "sandbox" game where you have levels that are incredibly large arenas containing an objective. You can get the job done any way you want adding to the beauty of the gameplay. These are huge environments and you can take circuitous route to use stealth or simply go gung-ho. And your nanosuit gives you much cooler options. You can become invisible for a while and snipe your opponents or zip through quietly hurling them off a cliff. You have incredible speed and your suit helps you heal. But that doesn't make you invincible. The game has such highly advanced physics that most computers will cry in shame. But if you have a machine that can supply the juice you are in for a treat. A jungle firefight easily becomes a cinematic treat as bullets will chop down trees, branches sway from impacts and even falling on someone killing or maiming them. Wreckage can land anywhere and for al you know. It's sometimes unpredictable and adds to the fun. Weapon recoil and other ballistics effects are realistic. Long distance shots take a while to affect as the North Koreans are encased in body armor. Shoot them in the ehad and they are out for good. Silencers let you take down guys quietly, though they reduce bullet damage so you have to make sure you hit the target right. Action becomes larger and more intense as your progress. You'll storm North Korean-held villages and bases and even drive a tank through the vegetation and knocking down trees as missiles and tank fire erupt all around you. It is simply stunning to watch. And then come the aliens. The AI is excellent as they are not just dummies popping up to be killed. They actually hide and use cover to save their hides. They will toss grenades to flush you out of hiding. Fighting with the AI is rewarding because it makes you work for your victory instead of just picking them off randomly. And when you get into the difficult mode, AI doesn't cheat, just speaks in Korean so that you don't know what they are saying. The single-player game is awesome and the multiplayer mode is excellent with five large maps to support it. I couldn't play the latter but from video reviews, it seems a busy game indeed. Everybody has their suit powers so there is a lot of high intensity action going on. With built-in voice support, a microphone allows you to talk to your fellow players and teammates. With a basic surround setup, you can truly get immersed. The soft crunch of dirt as you creep about, the muffled sounds as you turn on your suit's cloak and fire from all sides is just a small dose of the aural goodies. It's also got excellent voice acting delivering a little humor as well. It's a long game. It's a beautiful game. My first complaint is that it is not long enough. The second is that it needs a fairly potent machine. It's also got good replay ability as you can go back and try out the large battles they can unfold in different ways each time. With smart AI and a smarter story, it's an engaging game. This movie is loaded with coincidences couple with a bit of overacting adding up to a mushy, sentimental movie. But that's not necessarily a bad thing is it? Evan Taylor (Freddie Highmore) is an 11-year-old who runs away from his orphanage rather to escape from being placed with a foster family. He heard that his parents are still alive. He wants to find them and that too through the power of music. You see, his parents were musicians who met through their music. It was love at first sight seen through flashbacks. Apparently, music has Power with a capital 'P'. The parents Lyla (Keri Russell), a cellist and Louis (Jonathan Rhys Meyers), an Irish rock singer, make love strictly adhering to the PG rating so we don't see anything but we know what happened. They plan to meet again but Lyla's father forces her to leave town for career reasons. The lovebirds have no way to contact each other. They should have swapped phone numbers or an email address at least. Lyla is pregnant with Evan but her father focusing on her career, manages to get rid of the baby boy and tells her that Evan died. Evan is packed off to an orphanage from where he escapes after growing up just a little. Evan as it turns out is a naturally gifted musician. After running away he ends up on the Washington streets where he picks up a guitar seeing some street musicians and starts strumming out tunes. Another young musician spots him, takes him back to an abandoned theater to hook up with a band of similar young boys who work under a character called the Wizard (Robin Williams). The Wizard sends this group of small musicians out into the streets every day as buskers. 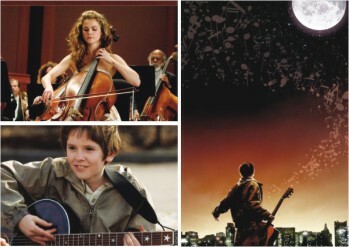 The Wizard spots Evan's talent and gives him the moniker "August Rush." Evan becomes noted for his skills and ends up conducting a small symphony at an outdoor concert in Central Park. He shows he's an expert and that too in the presence of his cellist mother rocker father. They are around and somehow music does connect them all. It's very much like Dickens' Oliver Twist and sweetly things all fall into place. There's melodrama aplenty but it doesn't make the story tacky. It's your classic tear jerker and is a light hearted as well as humorous (it's got Robin Williams) flick. Young viewers will especially like it but so will the not-so-jaded old ones. A sentimental movie this is definitely not. In fact it lack all sentiments and settles for cold hard ruthlessness. For a while anyways. Movies adapted form games often have very iffy outcomes. Think of Doom. It was punningly doomed. 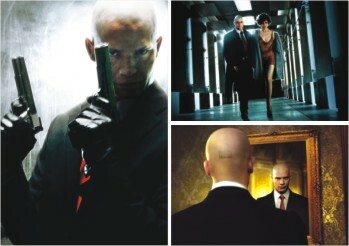 Agent 47 from the hit game Hitman is one of those characters that beggar a movie all about them. He is a character especially considering he is bald and has a bar caode tattooed on the back of his head. It's not a very good disguise considering he is wanted for more than a 100 kills across the world. Agent 47 (Timothy Olyphant) was raised as an orphan from birth by a shadowy organization named simple The Agency. Governments use their services to perform assassination that thye cannot conduct directly. Agent 47 knows all the tricks, he's cool, suave, ruthless. He's the perfect killer. That is until he meets the young woman Nika (Olga Kurylenko). She somehow proves to be a bit of a chink in his cold armour. Nika is a prostitute held in slavery by the drug-dealer who happens to have all the power because his brother is the Russian president. Now Agent 47 is in Russia on a job and that is to assassinate the president. In his efficient manner he does it. But the next day the president is seen in public alive and speaking. Agent 47 does not miss. So what's the mystery? What follows is a web of lies and deception part of it involving 47s betrayal by the Agency. He has Nika tagging along with him and what follows is one great shoot-out after another. The movie has a lot to tell and then again not much. It's got an intriguing tale but hardly nay character development. And let's face it, we watch movies for the characters. It's different form the game as it has a single story to tell. Which is a good thing. It does pay homage to the game in terms of the fight sequences and most times even outdoes what the game offered. Despite the high level of violence it has little gore. It makes for an entertaining action flick but don't try to pull parallels with the game itself. It's stylish to the point of being art. But we could have done with a bit more about Agent 47 instead of the jobs he has to do. When my friend Tahiat sent me an ecstatic e-mail saying “OH MY GOD I MET TYLOR HILTON!” I didn't really make much of the news. Then I started watching the television series One Tree Hill, where in the second season, the arrogant and utterly lovable Chris Keller makes a debut, and totally fell in love with the cover of the Ryan Adams song “When the Stars go Blue” which Keller sings in a duet with another character Haley (Bethany Joy Galeotti). I realised then, with a jolt that the cute guy posing with my friend on her display picture was none other than Chris Keller himself! This led to an increased interest in the actor, which deepened as Keller slowly evolves in the series as more than just a pretty face. This Sagittarian was born Tyler James Hilton (24) in Palm Springs, California and began his professional career in music in 2000. 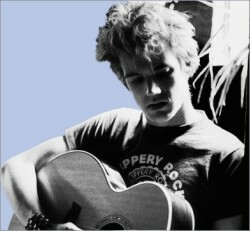 Rolling Stone Magazine compared him to his contemporary, Howie Day, while others have compared Hilton to Elton John, both vocally and instrumentally. Raised in Bermuda Dunes, CA, Hilton grew up around music and began teaching himself Elvis Presley songs at an early age. After a brief stint in Northern California, his family moved back to the Palm Springs area, where he wrote his first song about a classmate. Hilton's family made another move back to Coachella Valley for high school, where, at La Quinta High School, he started a band with some of his classmates. The band didn't go anywhere, so Hilton began to enter open mic nights and went to local coffee shops to play his own music. He got his first break at age 16 when, upon hearing about a local radio station's offer for giving away Johnny Lang concert tickets, he called into the Mark & Brian radio show on KLOS in LA, and sang an acapella version of Lang's “Breakin' Me”. The impromptu audition landed him a spot at the station's Christmas concert. This eventually led to a record deal with Maverick Records, and his debut album The Tracks of Tyler Hilton was released in 2004. Since the release of his debut album, Hilton has ventured into acting, guest starring on The CW's television show One Tree Hill as the talented but somewhat pompous Chris Keller, and playing the role of Elvis Presley in the Johnny Cash biopic Walk the Line. Hilton has just finished filming his role in the upcoming film Charlie Bartlett. Currently, he is in the process of recording a second album in Nashville.